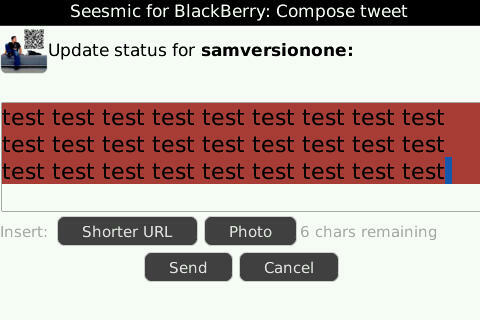 Today Seesmic released a new Twitter app for the BlackBerry smartphones. I’ve used Seesmic Desktop on the PC and Mac and found it to be a very good desktop Twitter client. How does the mobile app stack up? How is it compared to the other apps we’ve seen so far? Let’s take a look. 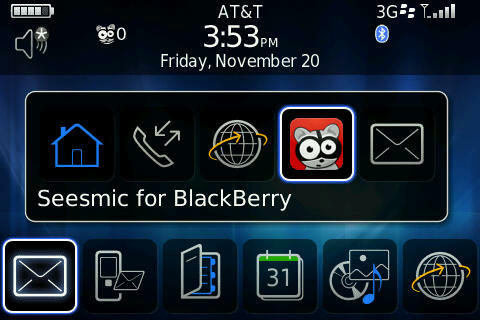 When you first install Seesmic, it adds the little Seesmic raccoon icon to your notification tray. This is very similar to what Vodaphone Update did where it kept the icon constantly in the tray. 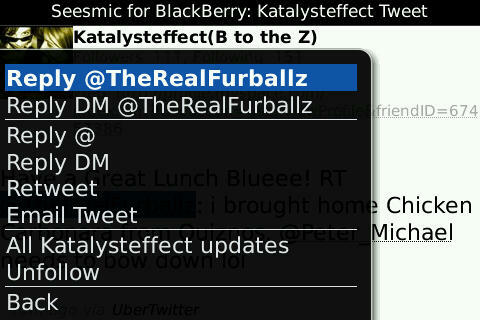 The number next to it shows you the total number of Direct Messages and Mentions that you have unread. Currently I have zero. Let’s head to the app now. 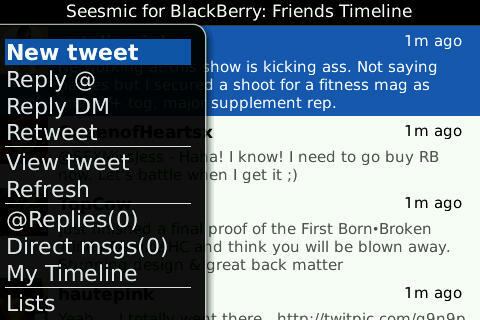 We just hold down the BlackBerry button to bring up the task manager open up Seesmic from there since it is running in the background. Handy shortcut to use. Upon first opening the app, you are brought to the main timeline. 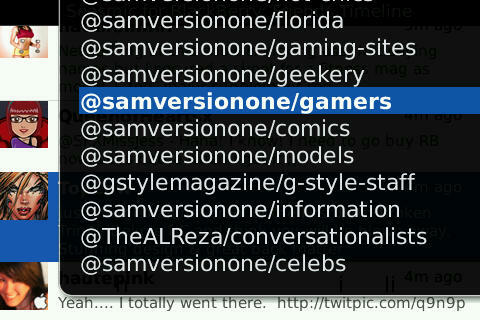 Here you see all tweets including mentions and direct messages. It refreshes automatically every 5, 10, 15, 30, or 60 minutes, depending on how you have it set. You can also manually refresh the timeline. One feature missing is keyboard shortcuts! There is no way to quickly move to the top or bottom of the list. You must go to the menu item in order to do that. *Update: Forgot to mention that there is no color separation between tweets. I would love to see Seesmic use some color to highlight mentions, direct messages, and your own updates in order to separate it from the normal timeline. 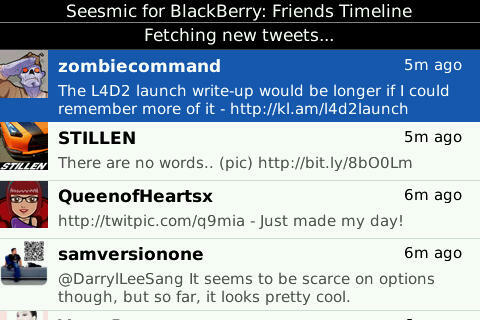 Pressing the BlackBerry key brings up the menu here in the main timeline. This is where you do everything. The menu items are pretty self explanatory. 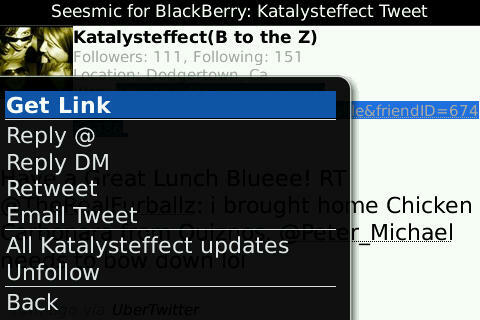 You will also notice something you don’t see on any of the BlackBerry Twitter app, and that is the inclusion of the new Lists feature. This is the Lists menu. When you click on Lists in the previous menu, it will bring up this sub-menu of all your lists as well as any Lists that you follow. Again, this is the only app on the BlackBerry that I have seen do this so far. Back to the main timeline. When you click on a tweet, it brings up this screen. It shows the user’s name, number of followers and following, location, and their web site info. It does not show any Bio information however like the other apps do. By clicking the BlackBerry button here, you can reply to the user, DM, serach any hashtags they have, reply to any user mentioned in their tweet, follow, unfollow, view their timeline or you can even email the tweet to yourself. 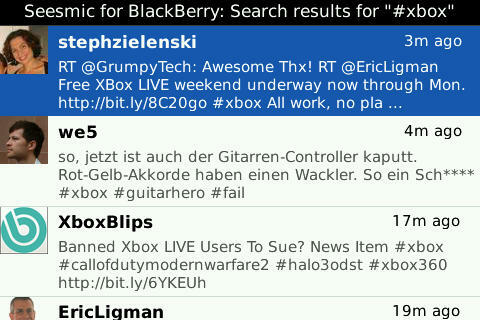 The one thing here that it looks like you can not do is jump to another users profile that is mentioned in a tweet. Maybe in the next version. When you reply to a tweet, it shows the following. Nice graphical touch up above where it shows you who you are replying too. 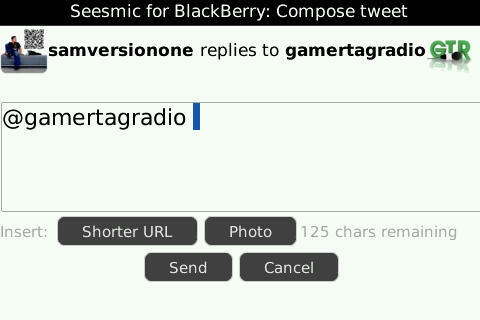 As you can see, you can shorten URLs in this app as well as upload images. 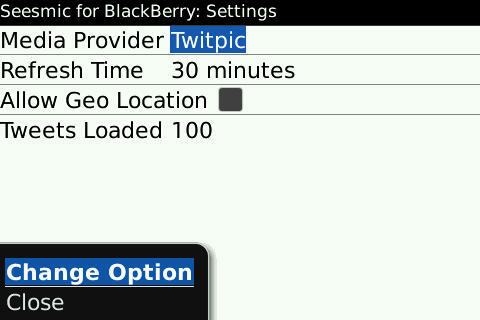 So far, it only uses either Twitpic or yFrog. Hopefully they will have more choices for you with coming updates. Here is the regular update screen. There is one very cool feature that Seesmic has implemented here that I have not seen done on other apps either. As you are typing, when you near the 19 characters left limit, the test area starts to gradually turn red. As you go past this limit, the red gets darker and darker until you reach zero where it is now a very dark red. I find this to be very intuitive as it gives you a visual clue that you are coming close to the 140 character limit that Twitter gives you. Kudos to Seesmic on this small yet useful addition. This is Seesmics options screen. Not very much to see here. Compared to other apps, its pretty bare. Don’t let this fool you though. The app seems to be quite powerful, especially for its first outing. 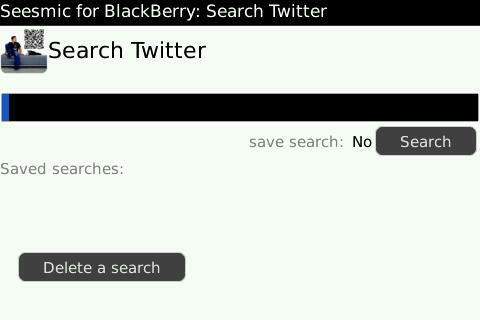 This is the search screen. You can choose to save or not save your searches. Typing in a query brings up the screen below. 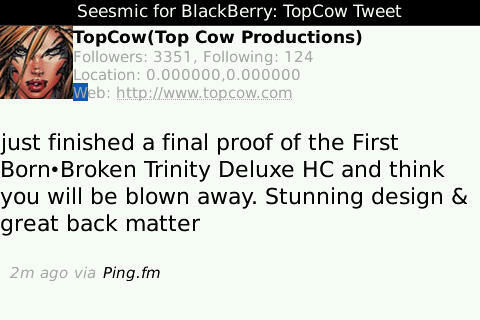 That’s pretty much it for Seesmic. The app might not have all the bells and whistles that some of the other apps like SocialScope or UberTwitter have, but it is a terrific light weight app that is very fast to load and use. I would compare this app to the Vodaphone Update app in features. It may not have Facebook integration yet, but since it is a Seesmic app, they will most likely add it in future upgrades. 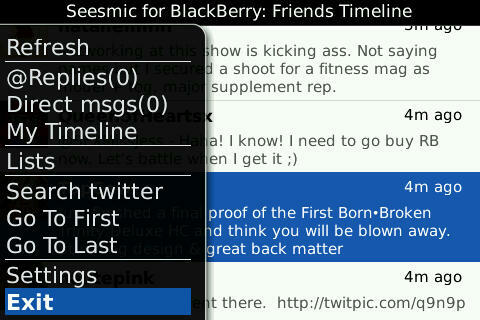 I was using SocialScope as my default BlackBerry Twitter app, but I think I will switch to Seesmic for a few days to see how it does in terms of battery usage and how I like it on a day to day basis. In the meantime, I do recommend that people try this app. It seems like it will be a very good app for many. Disclaimer: I have not been paid or asked to do a review for Seesmic. This review is done by myself and to inform those of what the app is capable of. I have in no way, shape of form been contacted by Seesmicprior to this review. All I do is set the app to one of the side buttons and press it when I need a capture of the screen.